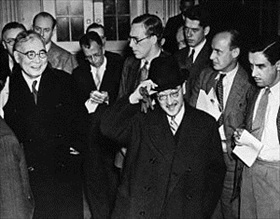 On this date in 1941 in Washington, D.C., the U.S. State Depart­ment advised Amer­i­can citi­zens to leave Japan. Two sum­mers earlier the State Depart­ment had in­formed Japan that it would not renew the 1911 Treaty of Com­merce and Navi­ga­tion between the two coun­tries, leaving the U.S. free in Janu­ary 1940 to im­pose eco­no­mic sanc­tions against the island nation as punish­ment for its 1931 in­va­sion of Man­chu­ria and its bar­ba­rous aggres­sion (since 1937) in China. By 1939, the Japa­nese occupied Bei­jing, the Nation­alist Chi­nese capi­tal of Nan­king (Nan­jing), China’s major sea­port Shang­hai, and prac­ti­cally the entire Chi­nese coast­line, as well as China’s major in­dus­trial areas. Amer­i­can aid to the belea­guered Chi­nese con­tri­buted to the rise of ten­sions between the U.S. and Japan, as well as the pro­hi­bi­tion in mid-1940 to sell avi­a­tion gaso­line, steel and iron scrap, and mechan­i­cal parts to Japan, which the Japa­nese were con­verting into war mate­riel. In early 1941 the U.S. issued direc­tives requiring export licenses for the ship­ment of copper, brass, bronze, zinc, nickel, potash, and the semi-manu­fac­tured pro­ducts made from those mate­rials. The action gave Wash­ing­ton further con­trol over trade with Japan. In late July 1941, reacting to Japan’s announce­ment on July 25, 1941, of a pro­tec­torate over Vichy French Indo­china (today’s Viet­nam, Laos, and Cam­bodia), the U.S. ended oil ex­ports to Japan and froze Japa­nese assets totaling $130 million. Great Britain and many mem­bers of its Com­mon­wealth followed suit and re­nounced all com­mer­cial agree­ments with Japan. Though their mother country had fallen victim to Nazi jack­boots two months earlier, officials in the Dutch East Indies (today’s Indo­ne­sia) froze Japa­nese assets and refused to pro­vide further oil ship­ments to Japan. On July 26, 1941, Presi­dent Franklin D. Roosevelt ordered the U.S. Army Forces Far East to be formed in the Philip­pines under the com­mand of 59-year-old Lt. Gen. Douglas Mac­Arthur, who had been recalled to active duty the month before. On August 1 the U.S. Navy estab­lished a naval air sta­tion on Mid­way Is­land in the Cen­tral Paci­fic. A Marine Defense Bat­tal­ion had already arrived in Amer­i­can Samoa in the South Paci­fic. Suddenly the Janu­ary 9 State Department advisory to leave Japan took on a heightened urgency. Storm Clouds Gather Over Southeast Asia: China vs. Japan vs. U.S. 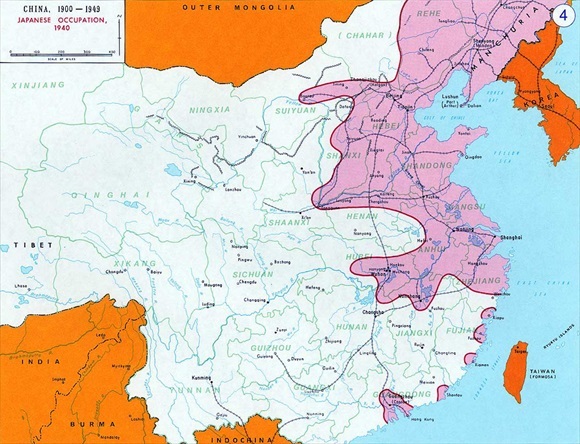 Above: Map of China, 1940, showing the extent of Japanese expansionism (in purple). Japan seized Taiwan in 1895, declared Korea an imperial protectorate in 1905, and invaded Manchuria (Manchukuo) in 1931. Left: On November 27, 1940, retired Adm. Kichisaburō Nomura was sent as Japan’s ambas­sador to the United States. Through­out much of 1941, Ambas­sador Nomura negoti­ated with U.S. Secre­tary of State Cordell Hull in an attempt to pre­vent war from breaking out between Japan and the United States. The two men attempted to resolve issues, among them the Japa­nese con­flict with China, the Japa­nese occu­pa­tion of French Indo­china, and the United States oil em­bar­go against Japan. Nomura’s repeated pleas to his superiors in Tokyo to offer the Amer­i­cans meaning­ful con­ces­sions were rejected by his govern­ment. 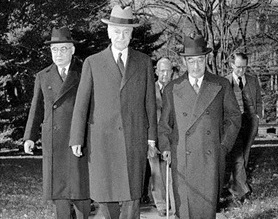 On Novem­ber 15, 1941, Nomura was joined by a “special envoy” to Wash­ing­ton, Saburō Kurusu, Japan’s ambas­sador to Nazi Ger­many from 1939 to Novem­ber 1941. Hull and the two Japanese (Nomura on Hull’s right) are shown in this photo­graph taken in the days leading up to Pearl Harbor.